Over the course of my career as a hockey goalie, I’ve worn a variety of breezers made by a handful of manufacturers. Sherwood, Reebok, and Vaughn have been the most notable. You’ll notice that not all of those are top-of-the-line, pro-spec models. I play mostly beer league hockey these days, and men’s league players just don’t put as much heat on the puck as the guys do in the NHL or even juniors. Thus, I don’t really need bulletproof protection. That said, I have found pro-spec goalie equipment to be more durable than senior-level goalie gear in the past, so I’m usually inclined to go the pro route if it doesn’t involve significant trade-offs. Making a save in my Vaughn Velocity V4 7600 goalie pants. Hockey rules! In the case of the Vaughn Velocity 7600 pants, the design hasn’t changed much since the days of the Velocity 7000 pants (both V1 and V2 variants). 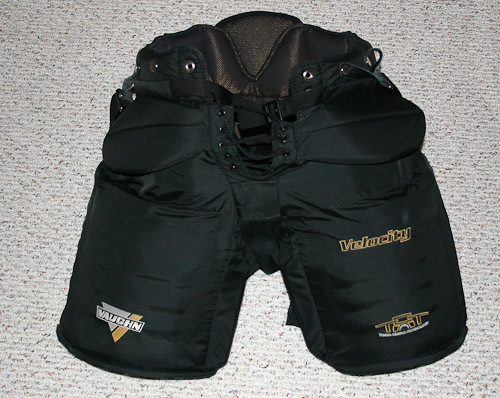 Vaughn tweaked a few things to make the pants conform to the post-lockout NHL rules, and the embroidering was updated, but for the most part, the design has been stable. That’s a good thing. These goalie pants provide great protection. Sure, the padding is a bit light in the front crotch near the laces, but that’s by design. Your goalie cup should be covering that area anyway. I’ve never gotten a stinger through the pants, not even at the interface between the main pant padding and the cup padding. I’ve been pretty satisfied with these pants. They’ve performed like a champ. That said, I have a few minor complaints. First, the stretchy material in the crotch seems prone to developing holes. This has happened in every one of the pairs of these pants that I’ve owned over the years. I acquired one of those pairs used, and it had occurred on them too before I got them, so I don’t think it was just me. The holes are easy enough to sew closed, but it’s kind of annoying to have to do so. The rest of the pant has proven very durable. Second, I find that the inner thigh blocks are a bit too long. I’m about 6 feet tall and have a 34-inch waist, so I wear a size large pant. It fits great everywhere except along the inner thigh. 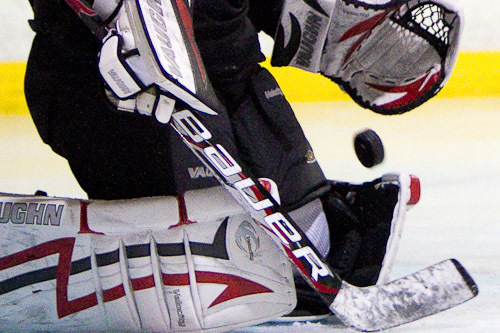 The thigh blocks (pads) along the inner thigh get jammed between the landing gear on my leg pads and my goalie cup. I ended up having a hockey gear repair shop in Minnesota unstitch the inner thigh channel, remove about an inch from each of the thigh block pads, and sew everything up again. With that modification, I no longer have the interaction problem between the thigh blocks, my cup, and my leg pads. These Velocity V4 7600 goalie pants feel great, fit great (except for that thigh-block problem), and look great. 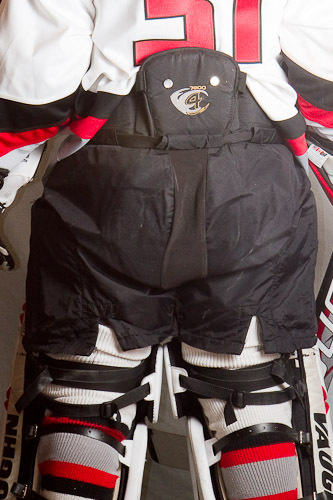 I think they are the best goalie pants available for beer league goalies or indeed any level of goalie.